Results from a clinical trial of more than 250 participants with progressive multiple sclerosis revealed that ibudilast was better than a placebo in slowing down brain shrinkage. The study was supported by the National Institute of Neurological Disorders and Stroke, part of the National Institutes of Health, and was published in the New England Journal of Medicine, and involved researchers across 28 clinical sites, including a team from UAB. 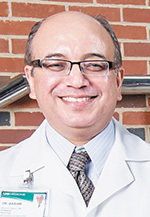 "This is a landmark study in patients with progressive forms of MS, which have been difficult to treat," said Khurram Bashir, MD, director of the Division of Neuroimmunology and Multiple Sclerosis in the UAB Department of Neurology in the School of Medicine. "This study provides hope for a potentially effective therapy." In the study, 255 patients were randomized to take up to 10 capsules of ibudilast or placebo per day for 96 weeks. Every six months, the participants underwent MRI brain scans. The investigators applied a variety of analysis techniques on the MRI images to assess differences in brain changes between the two groups. The study showed that ibudilast slowed down the rate of brain atrophy compared to placebo. There was a difference in brain shrinkage of 0.0009 units of atrophy per year between the two groups, which translates to approximately 2.5 milliliters of brain tissue. However, it is unknown whether that difference had an effect on symptoms or loss of function. There was no significant difference between the groups in the number of patients who reported adverse effects. The most common side effects associated with ibudilast were gastrointestinal, including nausea and diarrhea, as well as headaches and depression. MS occurs when there is a breakdown of myelin, a fatty white substance wrapped around axons, which are long strands that carry messages from and between brain cells. When myelin starts to break down, communication between brain cells slows down, leading to muscle weakness and problems with movement, balance, sensation and vision. MS can be relapsing-remitting, in which symptoms occur then disappear for weeks or months and then may reappear, or progressive, which is marked by a gradual decline in function.